First off, the size of the book is perfect. It is not an oversized coffee-table book but is something you can actually take into the field with you as a field guide. This hardcover book measures 5″ x 8″ and is almost 2″ thick and has 568 pages! 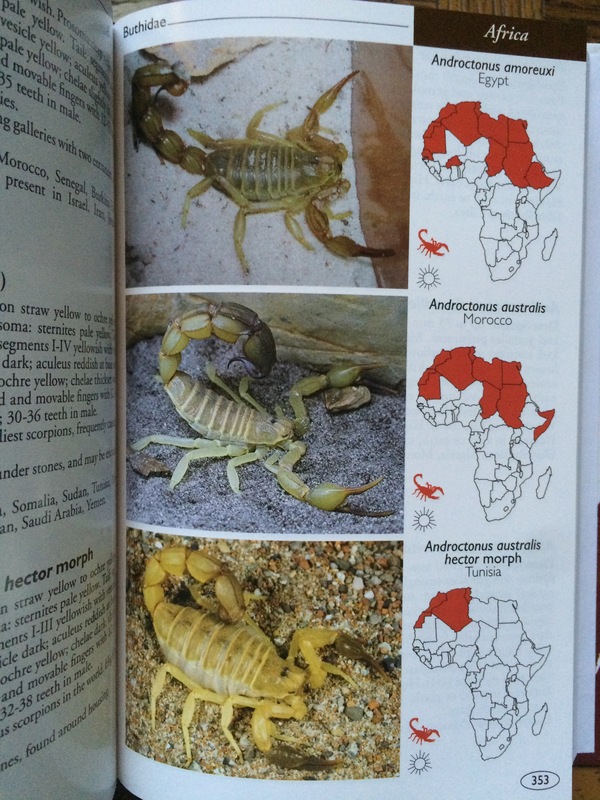 Over 350 scorpions species are described with beautiful color plates that will make identification much easier. 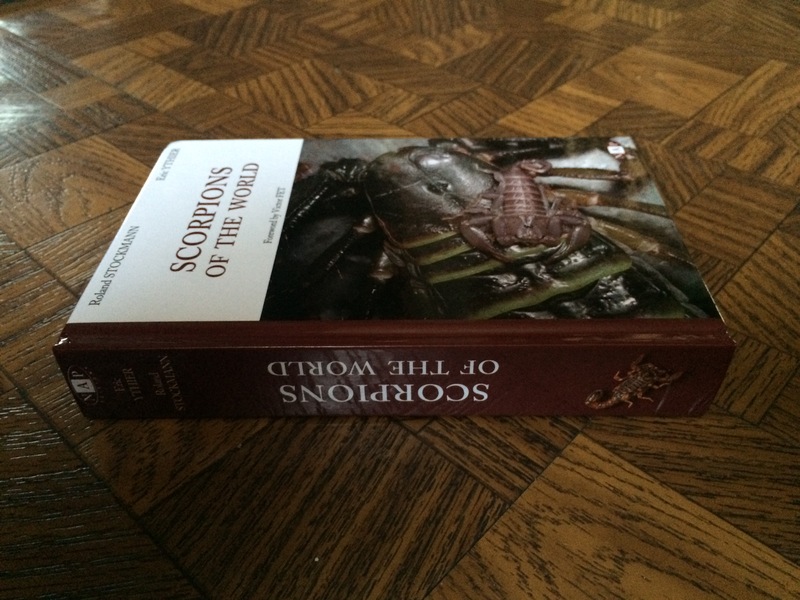 The first 245 pages deal with scorpions in general covering their biology and venomology. The detail in this section is phenomenal. 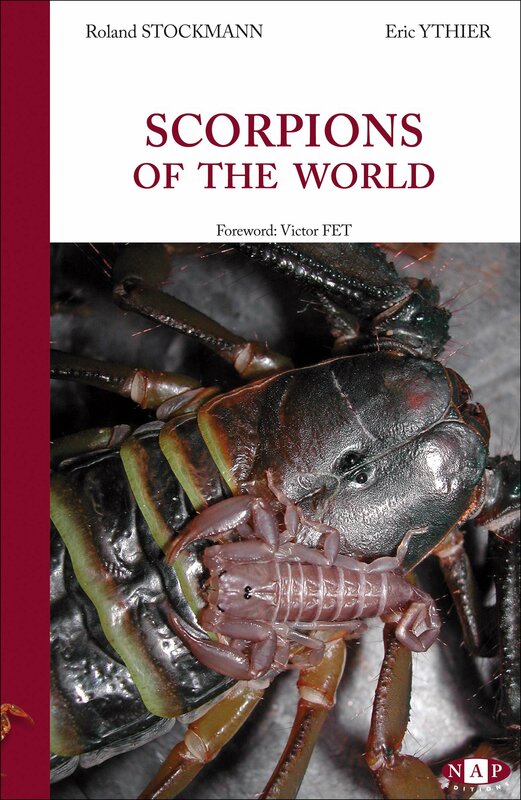 I am sure many scorpion purists will dispute some of this information, especially since this book came out in 2010, but keep in mind that information concerning invertebrates, especially when it comes to tarantulas and scorpions, changes and is updated almost daily. In the past these types of animals were not studied to the degree that they are now so changes are to be expected. 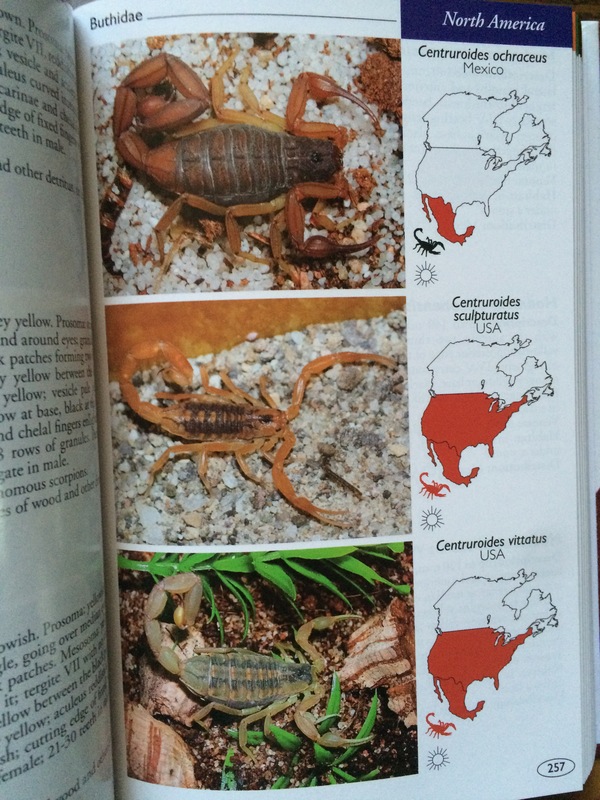 The rest of the book covers the species and acts as a great field guide. Each species includes information such as scientific name, who discovered it and when, a description of the species including coloration and size, how venomous the animal is (on a scale of 1 to 4 with 4 being the most venomous), habitat and distribution. Additional notes are included with some of the species. Then a full color photograph is included of the species and a location map, showing where the species can be found. This is actually where one of the major problems of the book comes in. When it comes to species indigenous to the United States, the whole United States is highlighted and not just the areas where it is actually found. This makes it look as though these species can be found throughout the country, which is certainly not the case. The map of the United States should have been more detailed, showing each state, allowing the actual states where the scorpion can be found be highlighted. The odd thing is that this very thing is done with countries like Africa, showing where specifically in Africa the species covered can be found. My only other complaint with the book, which is just my personal opinion, is the title of the book and how it is printed on the spine of the book. It is actually the opposite way it should be, at least based on how books in the United States are printed. I am not sure if this is how books are printed in Europe normally and if it is, then that is fine. It just looks weird sitting on my bookshelf as it looks like it is upside down. With the exception of the mapping of United States species, this book is a must have. Don’t let the price dissuade you as it is an important addition to any arachnid library. At the time of this writing I have only found this book available from sellers overseas on eBay and Amazon. All in all this is truly a great book and is highly recommended! This entry was posted in Book review, Scorpions and tagged Eric Ythier, Francois Teyssie, NAP Edition, Roland Stockmann, Scorpions of the World, Tarantulas of the World. Bookmark the permalink.